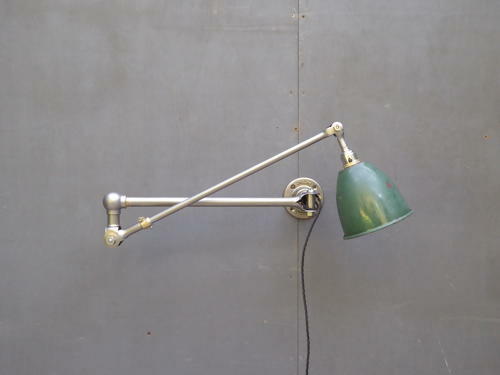 An original vintage industrial Dugdills wall lamp. A fantastic, meticulously restored articulated lamp in a stripped steel finish with a contrasting green & white enamel shade and cast iron base. Wear commensurate with age, excellent, fully restored condition with some fading & wear to enamel shade. Measurement above refers to the lamp flat out at full stretch.